It’s Monday morning. It wasn’t a great weekend for us but, you know, at least we didn’t lose to Brighton. Which is not to disrespect Brighton in any way. We went there last season and got beaten but I think that result has to be put in some kind of context: we could have gone away from home and played a team made up of feeble old nuns with degenerative muscle and brain illnesses and lost despite the fact they had two players sent off in the 3rd minute for fighting each other because one thought the other looked like Mustafi and she wanted to slap him in the face because her secret son was an Arsenal fan and spent most of the season crying at how bad we were defensively. It’s early days this season, of course, but I’m determined not to be too downcast at two defeats on the trot so taking some pleasure in the misery of others is always welcome. And just to make it clear, this isn’t about United per se, or United fans, or United players, but anything that brings Mourinho a little bit closer to meltdown can only be a good thing. Is it wrong for me to hope he gets pushed over the edge like Private Pile in Full Metal Jacket? It probably is, considering how that ended for him, but metaphorically, without the gun in the bathroom side of things, I hope it does. I can imagine the Man Utd players and supporters right now would love to stick a bar of soap in a sock, secure him to a bunk bed, and then batter the belly off him – and in this day and age of social media and Insta-Stories and the like, we’d all get to enjoy too because you can be sure Lingard wouldn’t be able to resist broadcasting it to the world. Is that where we are this early in the season? I can only speak for myself, but yes, yes it is. Their next game is against Sp*rs on this day week so a good old fashioned draw with six red cards, a couple of maimings, three eviscerations, a howdy-doody of the gooch and a colossal tantrum on Sky post-game is what I think we’re all hoping for there. As for us, as I said yesterday the first two games were always going to be very tough, and I think we saw signs in the first half of what Unai Emery is trying to do with his side. Watching the second goal again, you see the method in using the goalkeeper in the build-up and working it from back to front we put together a fantastic piece of football to score. It’s still way, way too early to know exactly what we’re going to get from Emery. The City game was basically a one-off that taught us nothing we didn’t already know: they are the best team in England, perhaps Europe, by quite some distance so it’s very difficult to learn anything about players and a system. Chelsea was a bit different though. We know they’re a tough team to beat at Stamford Bridge, but with a new man in charge they’re going through their own changes right now. They dominated, then let us back into it, and when they sat off us and gave us time on the ball and space in their half, we had the quality to hurt them. The goals we scored and chances we created were the most encouraging part of the game; the biggest worry was the way we defended. He really knows what he wants to do, how he wants to play. He’s not someone who is trying to change everything to show ‘this is my club now, my rules’. Most of the time it is little details, one or two metres that he wants you to move on the left and the right. It’s important because in games like today, most of the time details decide games. Details like, you know, not maintaining an absurdly high line on halfway when you can be exposed by a simple ball over the top? Some will say that’s on the coach instructing his team to play that way, which is fine, but if you’re a defender who knows how to defend, then you read the danger of that situation, drop off, and cut out the threat which is something Mustafi didn’t do. 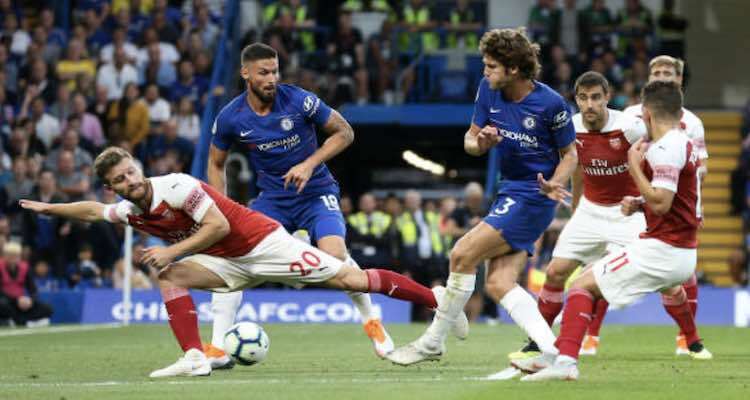 I read on Football London that after the game Emery’s assistant, Juan Carlos Carcedo, had words with Lucas Torreira about his role in the third goal when he could and should have tracked the run of Alonso better. I can only hope that he had a similar conversation with the German at half-time about the basics of positioning. I know it’s only two games, and I know we’ve played two good sides, but we’ve conceded five goals and, as Brighton showed yesterday, there are no easy games. For all the optimism we have about the new era, and the attacking potential of this team, I can’t shake the genuine worry I have about our defence. I know they can be protected better, I hope they are, but I just don’t think we have very good defenders. Obviously I hope that they can work together to create a solid unit, but I look at our roster of centre-halves in particular and right now I don’t recognise it as one that can provide the team with the platform it needs. The news that Emery has been focused on making us more defensively secure was very welcome, and I realise Rome wasn’t built in a day, but on the basis of what we’ve seen in our opening two games, our defensive Rome is basically Sp*rs new stadium: a total kip and a long way from being ready. It’s why, even in these early days, I also wonder about the way we played in the second half against Chelsea. It’s weird, because it wasn’t like he put on three defensive players to try and hold onto a lead, but there was something obviously missing when you look at the chances we made in the first period compared to the second. Is it a sign of a kind of conservatism on Emery’s behalf? It’s hard to say, because we’re only getting to know the new man and how he operates, but let’s hope he’s learning quickly about his team and his players, because he’s still got a few things to get right. The next few games and weeks will tell us a lot more about him than two fixtures against top six rivals. Righto, that’s it for this morning. James and I will be recording the Arsecast Extra this morning, so if you have any questions or topics for discussion, please send them to @gunnerblog and @arseblog on Twitter with the hashtag #arsecastextra. That’ll be up before lunchtime. Until then, have a good one.